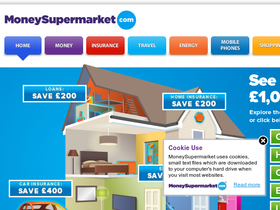 Moneysupermarket.com offers a free, impartial online comparison for users wishing to change their gas and electricity as well as their broadband suppliers. We aim to provide users with a service that ensures that they choose the right supplier for their circumstance as well as helping them save money. Check euVouchers for all the latest vouchers and deals for MoneySuperMarket. Check out Money Supermarket and you can save an average of £157 and even get £50 cashback with car insurance comparisons. Sign up for the newsletter from Money Supermarket and you'll get a free £20 wine voucher. Currently, save £100 on broadband services from MoneySuperMarket.com. Act now and save £325 for gas and electricity from Moneysupermarket.com.